Building a side-hustle routine isn’t easy, but since its launch in Toronto last year, the Hyr platform is helping 7,000 people in the city find that elusive second job or extra shift. “We’re growing at a rapid pace,” says one of the app’s founders, Josh Karam, pointing to the additional 3,000 workers using Hyr in New York City, where it launched six months ago. Developed by Karam and Erika Mozes, Hyr is intended to help workers make extra cash on the side, and on the flip side, help employers trying to fill shifts, connect directly with people looking for work. The app was developed and first launched in Toronto February 2017, and expanded to New York six months later. The app is targeting the hospitality and retail industries, says Karam, but they plan to expand the platform to encompass other areas including medical and fitness. That will take time, he adds, and for now, they’re very much focused on expanding their existing market in the two cities they currently occupy. The Hyr system becomes smarter as both the employer and employee rate each other at the end of the day. “But I think we’re a true work platform that let’s multiple verticals interact with it,” he explains. Prior to the app’s launch, it even got the attention of the provincial government, says Mozes, pointing to conversations she had with the Ministry of Economic Development and Growth. “They’ve been really great at making sure that we’re on the same page. They understand that we’re focused on job creation and that’s something that they’re really interested in,” she says. The Hyr workforce is mostly comprised of younger people between the ages 22 and 32, and 60 per cent of those workers are women, explains Karam. The average shift on Hyr is 4.5 hours long, and the average hourly wage per shift is $16.5. Most Hyr users already have a full-time or part-time job and are looking to supplement their existing income. That’s exactly why Mandy Magnan uses the app. 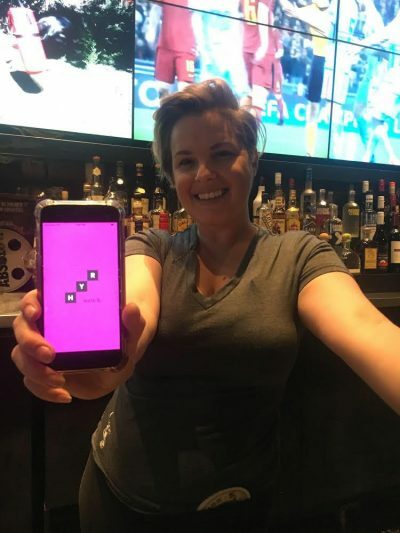 The Toronto actress, writer and producer tries to pick up at least four shifts during the week, usually at a restaurant or bar downtown, where she says she’s already become a familiar face since she first started using the app in January. She’s also worked as a brand ambassador for various companies, selling tickets and promoting events. In one week, she makes approximately $380 through the app. Mandy Magnan, a Toronto actress, writer and producer tries to pick up at least four shifts during the week. Photo submitted. “It’s [Hyr] completely opened up my schedule,” says Magnan. The app also does a good job of making sure employers posting open positions are clear about what they’re looking for in a worker. Yannick Bigourdan, owner of the Carbon Bar in Toronto, says they use Hyr at least once a week to fill empty shifts. He emphasizes Hyr is used only once all other options for filling the shift internally have been exhausted. “I think we’ve only had one or two instances where a shift wasn’t filled through Hyr,” he says, recalling both shifts were posted on the app at almost the very last second. According to Mozes, the fill-rate for shifts in Toronto is 98 per cent. In New York, it’s 94 per cent. The Hyr system becomes smarter as both the employer and employee rate each other at the end of the day, and Bigourdan says this ecosystem of trust also leads to potential full-time job opportunities for people who perform at a high level on a consistent basis. The only thing that would make the platform better right now is a larger network of workers, says Bigourdan. That’s the goal, suggests Karam, and as long as they continue to build steadily on what they’ve already created, it shouldn’t be a problem.